Just as we thought we've seen them all..now comes a new player in the Yogurt world. 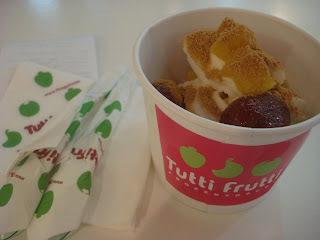 Coming all the way from California, USA; Tutti Frutti has finally arrived in Manila! Unlike its friendly competitors, Tutti Frutti will help you exercise your freedom to choose as you go through the entire self-service procedure with the help of their friendly staff. First, choose the size of your cup. If I'm not mistaken there are four different sizes. I like the huge tub at the far right, this is perfect for a group of four. Second, choose your yogurt flavor. 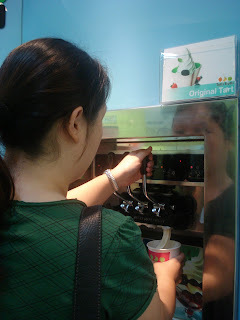 After trying at least six different flavors ranging from chocolate to taro and even fruit strawberry, I ended up getting the Original Tart which is your basic yogurt flavor. Third, take a pick from the wide variety of toppings. I originally wanted to get blueberries and crushed graham but the blueberries looked different that I just ended up creating my own mix -- strawberries + mangoes + crushed graham. Fourth, bring your yogurt masterpiece to the cashier and wait for her to ring up the total. The price begins at P19/oz. My total was just Php. 146.25 which I feel was pretty worth it considering I filled up my cup with lots of toppings. 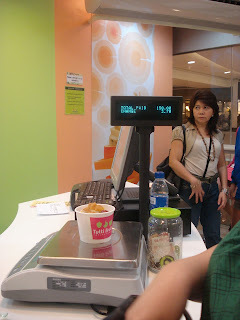 Tutti Frutti is located at the 4th Floor of the SM Megamall Atrium, Mandaluyong City. 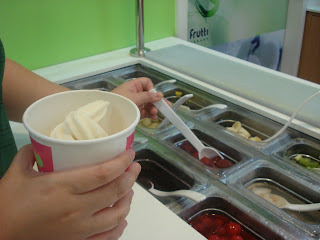 Naku, I'm stuck with White Hat, Red Mango, I love Berries fro-yo. I haven't tried other fro-yos since then. Hmm.. is it sweet like ice cream? Or a bit sour? Azy: wow! meron pala yun? wow!! Ahh. So I guess medyo sweet and sour? Hehe. My gf likes sour ice cream kasi. Hehe. I don't eat yoghurt - for some reason the phrase "with live microorganisms" get to me. I can imagine them crawling around in the yoghurt. Hahaha!! i just ate there lat night, i tried the taro and the original but i didnt like the taste. i cant seem to taste the "sour taste" that a yogurt must have. 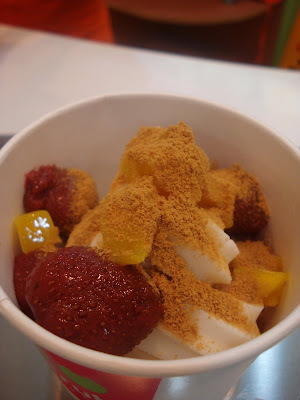 hi guys, just a heads-up..Tutti Frutti just opened its second store at the 3rd Level of Glorietta 4 in Makati. Another store is opening in late February at the Ground Level of SM San Lazaro in Manila. 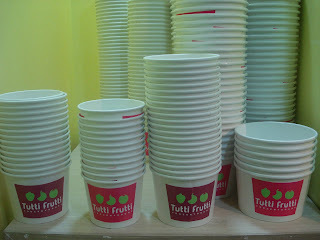 Nothing compares to the great taste of Tutti Frutti self-serve frozen yogurt from the USA..yummy and delicious! !